Posted on December 18th, 2017. Santorini is the most famous and well-known island in Greece. 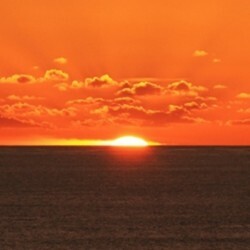 It is best known for its famous sun sets and incredible views. Santorini was devastated by a volcanic eruption in the 16th century BC giving the island its rugged look. The landscape is now filled with white washed luxury villas, overlooking the sea. 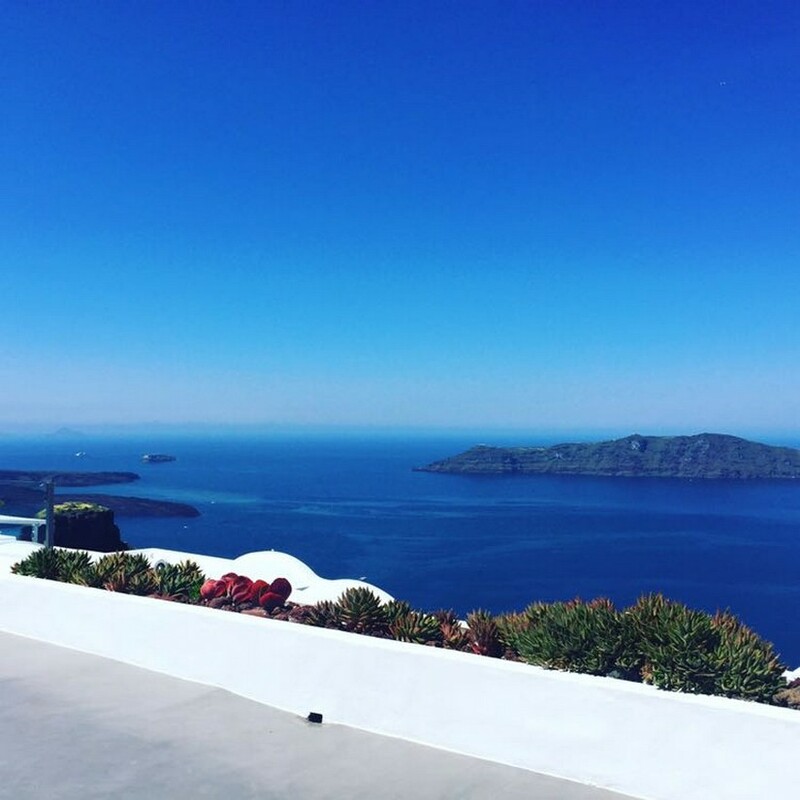 The main locations to stay in Santorini are Fira and Oia, however the island is so small, you are never too far away from the main attractions. 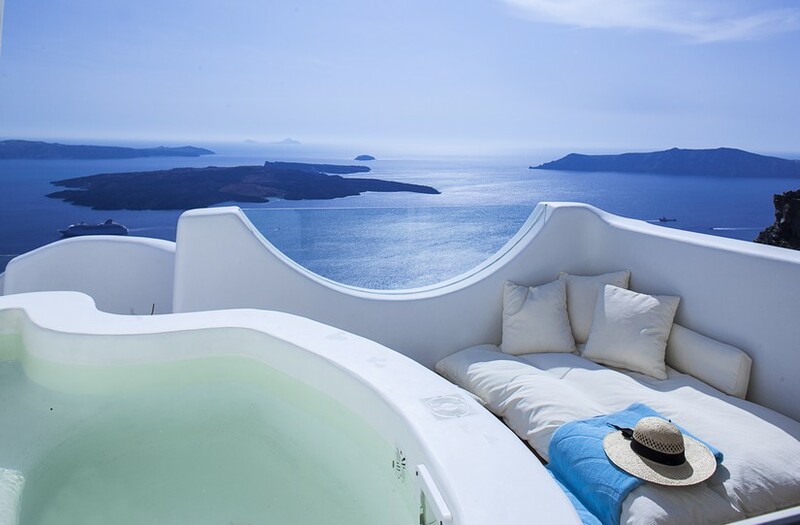 Below I am going to outline the most luxurious and best villas in Santorini. This is by far the most luxurious villa in Santorini. The views are absolutely amazing and the villa itself is stunning. Erossea Villa consists of 2 connecting levels, featuring 5 luxury suites for up to 11 guests. The villa has a Greek modern design. Every room is meticulously white with luxurious furnishings. When you stay at Erossea Villa, you will be able to enjoy the lavish breakfast menu which is included with your stay. The staff at the villa are very friendly and always there to help! The villa is located in Imerovigli. 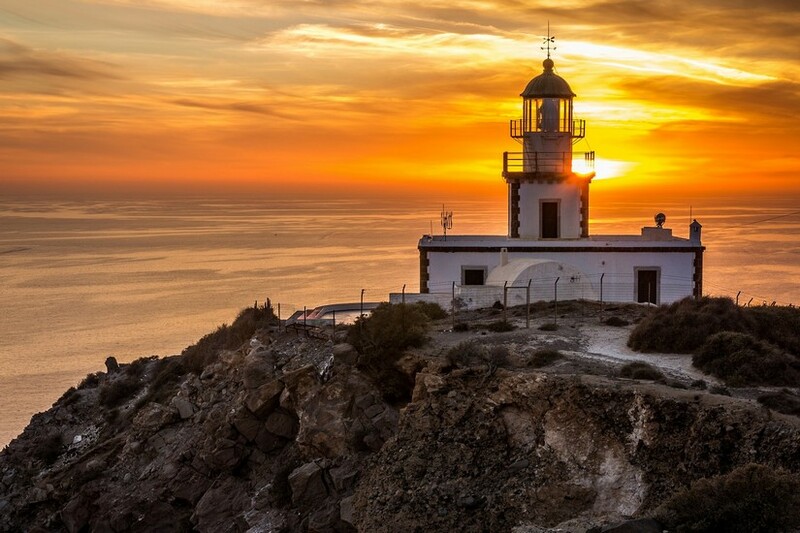 It has some beautiful restaurants nearby and you are also a very short drive to Fira. While staying in Santorini, I walked from Erossea Villa to Fira. It takes about 35 minutes and the views along the way are wonderful. You will find yourself stopping regularly to take amazing pictures. Erossea Villa is ideal for a group of friends or family travelling together. It would also be perfect for a small intimate wedding ceremony. Out of all the Greece Villas we saw during our stay this was by far my favourite property and is one of the best places to stay in Santorini. Villa Gaia is one of the best villas in Santorini. On our most recent trip to the island we stayed at this villa for 3 nights. It is such a beautiful villa and in the perfect location. 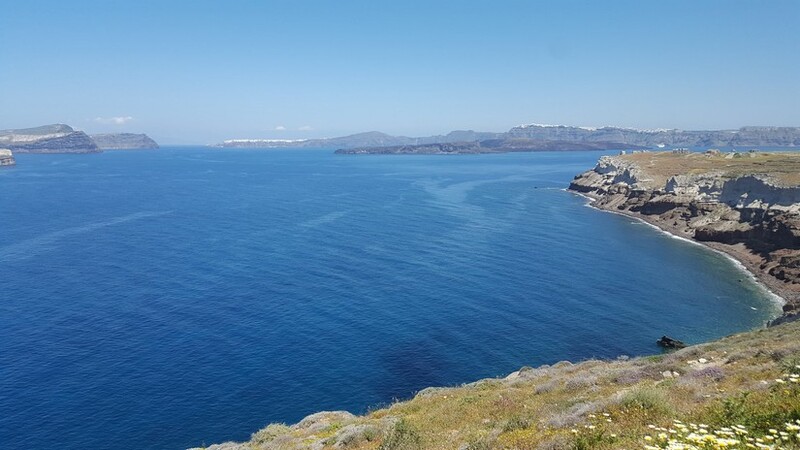 It has an elevated position along the caldera in Imerovigli and the views are simply to die for! There are sunbeds on the roof and I could have stayed here all day watching the boats go by sea. It is the perfect place to get some sun and just relax. Villa Gaia, like most villas in this area is not completely private, so for instance when you are on the sunbeds on the roof or having breakfast on the balcony, you will see people and neighbours passing by but this is something that you have to know before going and be ok with. Once you are inside the villa, you of course have complete privacy! The villa is on 2 levels and has 3 bedrooms in total. The main level has 2 bedrooms and the main living area and kitchen. The lower level has its own bedroom and this is a perfect space for people looking for extra privacy. The 2 levels are connected by a staircase and also on the lower level you will find a jacuzzi! The location is great. It takes about 20 to 25 minutes to walk to Fira from Villa Gaia. Again, you will find yourself constantly stopping to take pictures of the sea, the old churches and the sunset! Villa Gaia is a very popular villa and has a rate of €900 per night in the high season. I would strongly recommend securing this villa early as it doesn’t remain free for long! Native Eco is a beautiful 4-bedroom villa and it is located just behind Villa Gaia. If you were a large group needing 7 bedrooms, then I would highly recommend these 2 villas together as they are so close to one another. The inside is your typical Greek design with beautiful white smooth walls. As the villas in the caldera are all built into the hillside, each room is like a mini cave. I really like this villa. It is very comfortable and again, the views are just out of this world! The villa is split on 2 levels which are joined by a staircase. There is a jacuzzi on each floor which is great for the guests. The seating areas are my favourite part of the villa. They are furnished with soft comfortable cushions and chairs. It is the perfect spot to enjoy your morning coffee while staring out at the sea. There is also a beautiful little nook area too on the top level by the jacuzzi. This is a great area to lie back and take in the sun or read your favourite book. Like Villa Gaia, you are a 20 to 25-minute walk to Fira. If you are looking for a 4-bedroom Luxury Greece Villa, then Native Eco would be the perfect one. It has everything – luxury, privacy and unbeatable views! And like I mentioned previously, if you are a large group but want to stay in this location, the Villa Gaia along with Native Eco is the perfect combination. Villa Black Rock is a Luxury Greece Villa located near the famous lighthouse in Akrotiri. If you are looking to have a luxury villa in Greece but also want to have complete privacy, then this is the perfect villa. 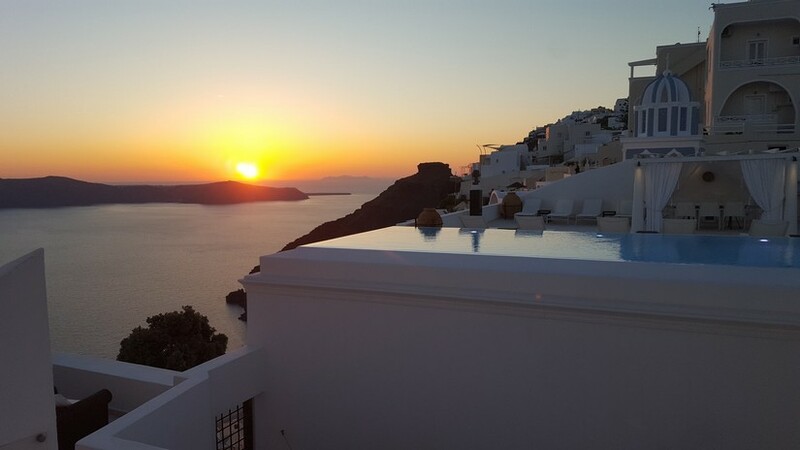 Even though you are not on the caldera, you will still get to enjoy the amazing ocean views and the sunsets! Black Rock has 5 bedrooms so it is perfect for a large family or group of friends travelling together. I really like the pool area as even though it is just below the villa, it is still private. The pool is a decent size and there is also a jacuzzi from where you can watch the beautiful sun go down. This beautiful white-stone villa enjoys a blend of modern and traditional Cycladic architecture. It is a very spacious villa, spread across 3 floors. There are several living, dining and reception areas, so you will always have somewhere to sit back and relax. The best part of this luxury Greece villa is its amazing recording studio. Yes, you read that part correctly! 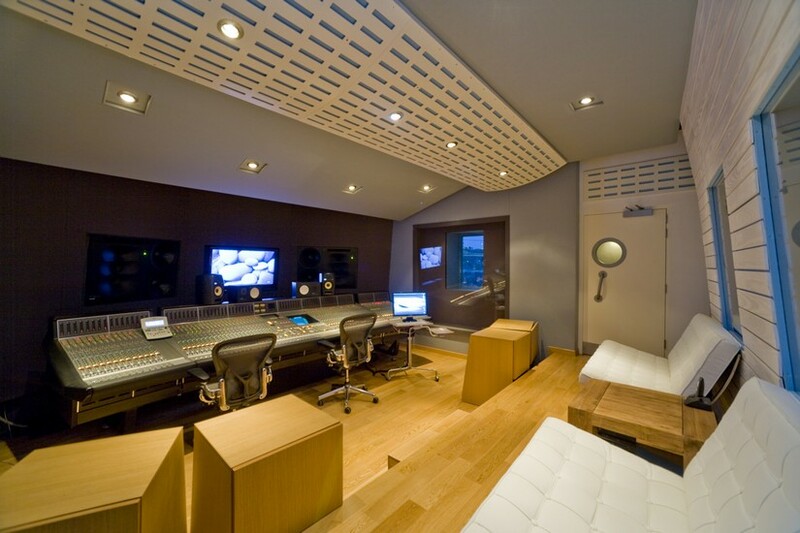 Black Rock features a state of the art recording studio. Iron Maiden’s Steve Harris, American pop rock band One Republic, as well as American superstar Justin Bieber and singer-songwriter Angelika Dusk are among those who have recorded in the Black Rock Studio. 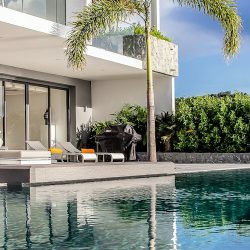 It is easy to see why these artists come to Black Rock, as they can work in world class facilities and relax in a luxury villa that offer total privacy. Black Rock is definitely one of my favourite villas in Santorini. It gives you a remote feeling without actually being too far away from the major attractions on the island. If you like to have privacy on your vacation, then this is the villa for you…plus you can also record that album you’ve always wanted to do! 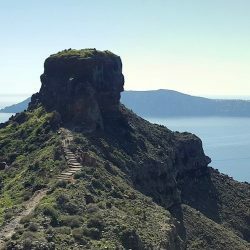 Read about Alex’s trip to the top of Skaros rock in Santorini. There are so many reasons to go to Santorini. First of all, the views! 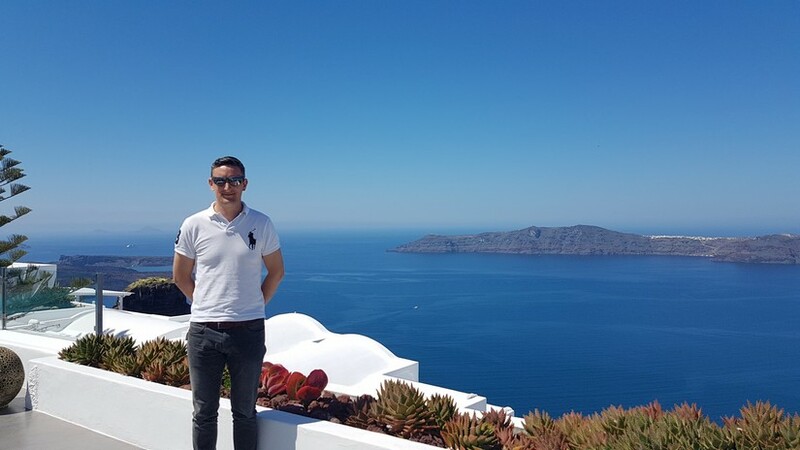 As you can tell from my piece about the villas, they all have amazing views and to be honest the views from this amazing island have to be seen to be believed. They really are incredible. I constantly found my self stopping to take a picture, thinking this is the best one, only to take a better one 2 minutes later. The one thing I would recommend is to try put your camera away for a while or even an afternoon if possible and just take in the views. I think everyone is guilty of spending so much time on their phones, looking to take the best picture without actually taking in what they are looking at. Santorini is also a beautiful island to drive around. The roads are safe and I found the local drivers to be patient towards tourists, which is a great help. On my most recent trip with Exceptional Villas, we drove out to the lighthouse in Akrotiri and worked our way back to Oia. From the lighthouse we stopped off at Akrotiri Beach. 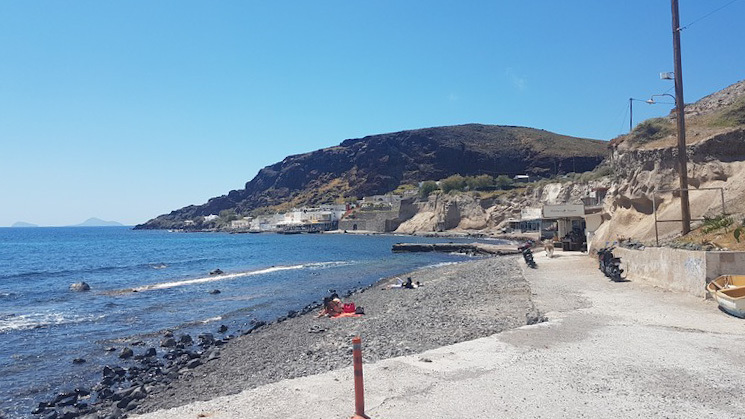 It is not an ideal beach for swimming but it is still beautiful there; Santorini has many beautiful beaches. However, if you are especially interested in a beach holiday then Mykonos might be more of your thing. There are 25 Mykonos beaches with atmospheres ranging from quiet gentility to epic beach rave; take your pick! You can have lunch in the café and listen to the sound of the ocean. The beach is just a 2 minute walk from the Akrotiri Archaeological Site so the café is the perfect place to go after the museum. 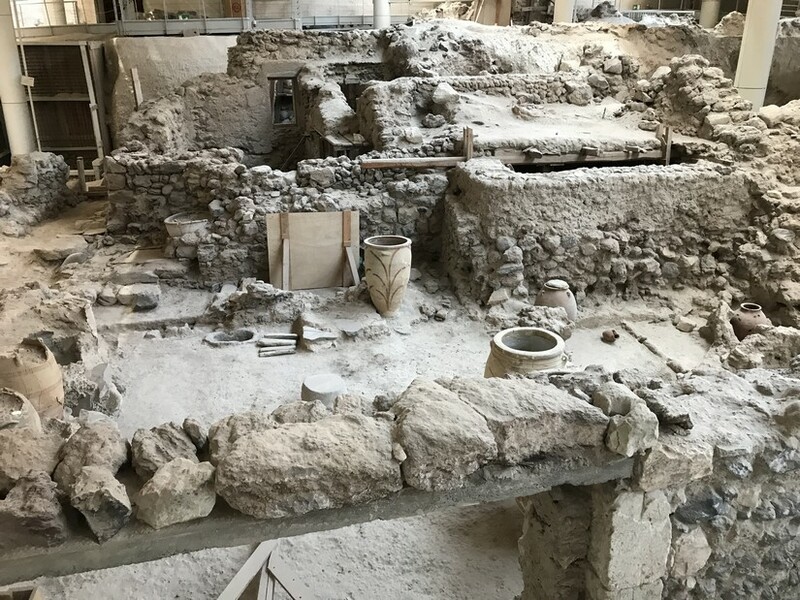 The Akrotiri Archaeological Site is an absolute must when you visit Santorini. It gives you an amazing insight into what life was like all those years ago. The settlement was destroyed in the Theran eruption about 1627 BC and was buried in volcanic ash, which preserved the remains of fine murals, many objects and artworks. The site has been excavated since 1967 and you can now see how the location looked before the volcano. From here we drove directly to Oia. It took about 40 minutes to drive to Oia. It is a really beautiful town and very busy with tourists. Everyone gets there early looking for the best place to see the magical sunset. There are lots of nice shops and boutiques in Oia, along with some tasty restaurants and bars. We found a lovely little bar where we enjoyed a pre-dinner drink and watched the sunset. After the sun had set, some of our team walked down the many steps to Ammoudi Fish Tavern. Thankfully I brought the car down to the restaurant, as even though the walk down was nice, after such a delicious meal I would not have fancied the walk back up! The food in Santorini was superb. Every meal we had was excellent. I always think it is a good idea to research restaurants before travelling and even have some bookings made but also there is something nice about walking around the town and looking at the different menus and locations and when you find a real gem, it makes the experience all the better. 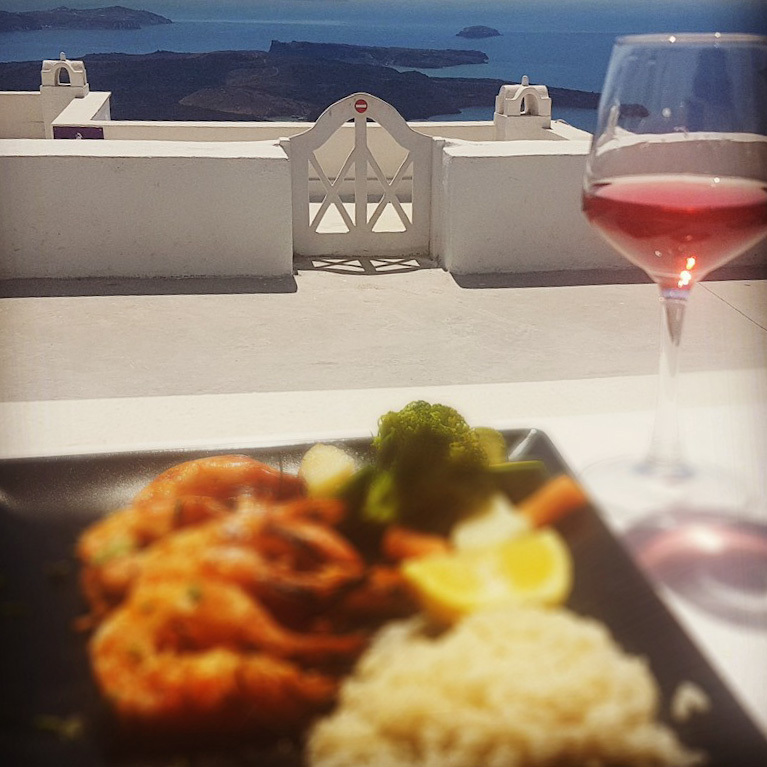 Our concierge At Exceptional Villas would be delighted to pre-book any of the Santorini restaurants for your in advance of your stay. Santorini is without a doubt one of the nicest islands in Greece and is very easy to get to. 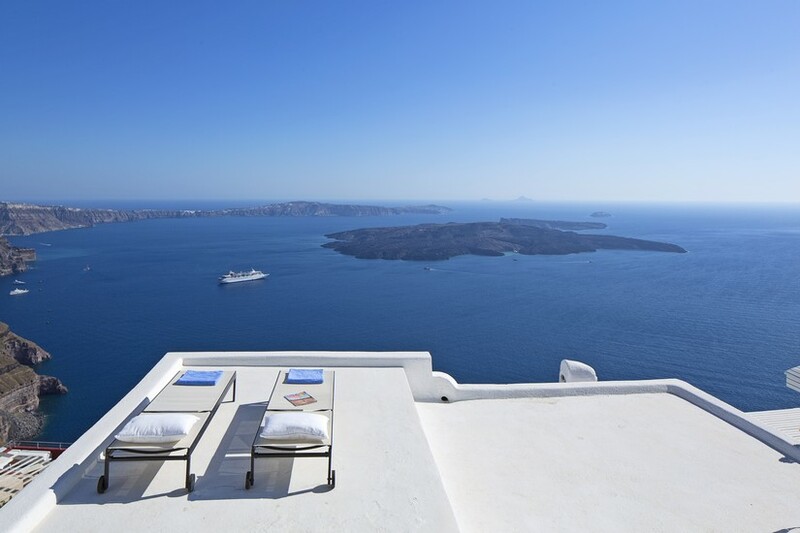 Each of our luxury Greece Villas on island offer the best views imaginable. 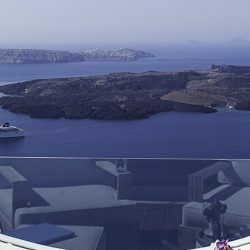 If you are looking for a luxury villa in Greece or want to find the best villas in Santorini than feel free to contact me. We would love to hear from you… if you have been to Santorini and have some tips to offer or you need any advice, please leave a comment or contact us.